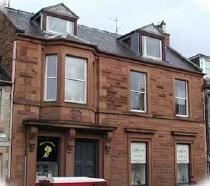 Old Bank House is in the beautiful town of Melrose famous of course for the Rugby Sevens in April. For the walker we have the start of the Southern Upland Way. For the fisherman we have the River Tweed, there are a number of excellent Golf courses and we have the Melrose Book Festival in June. We have the Wynd Theatre which has superb shows month on month and at night we have a selection of first class eateries. Old Bank House was as the name suggests a Bank. The dining room was the bank manager's office. All three bedrooms are beautifully furnished with full en-suite facilities. A warm welcome awaits the tourist to this accommodation. Walkers - there is a drying room for your wet gear. Rates for single occupancy available. Small bed can be put up in either the double or one of the twins. There are a number of stairs to some rooms, please discuss if you feel this may be an issue.